If you’re thinking of something different for your kitchen design, then think pink. A pink kitchen is a sure fire way to inject a boost of positivity and personality into an interior scheme. If you’re into brights then a hot pink backsplash could bring the colour blast you crave; for quieter tastes there are beautiful pastel pink kitchen cabinets that look divine finished with a white marble worktop. You can also easily add pink to an existing kitchen installation by introducing pink appliances and pink kitchen accessories, or even just a lick of blush paint. Here are 51 tips and tricks to make your kitchen design look rosy. Turn up the contrast. If your kitchen is going to be on show in an open plan scheme then you might as well make it pop. The light pink kitchen units and pink wall decor in this space sits atop black base units and black floor for a high contrast result. Add in drama with dark cabinets. When we first think of a pastel kitchen we might think of an ultra light and airy space, but pastel pink kitchen units look just as good when teamed with black or grey cabinets and decor. 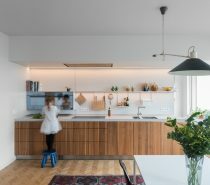 The raw wood dining table situated within this L-shaped kitchen arrangement helps bring a quiet balance between the two ends of the colour spectrum. Paint with light and shade. 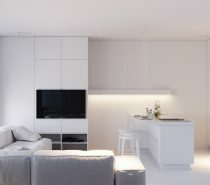 This all out blush pink minimalist kitchen creates visually interesting tone by using areas of light and shade. Strip lights around the frame of the backsplash and the ceiling perimeter help add dimension to the flat colour. Accessorise pink kitchen decoration with warm metallic accents. Gold lights and copper kitchen accessories look gleaming and gorgeous against blush pink. Give it just hint. It’s possible to find a hint of pink in white paints, greys and beige to bring just a delicate note of rosiness to a room. This simplistic interior layout is based on the traditional Japanese aesthetic of Wabi-Sabi. The idea centres around the acceptance of transience and imperfection, which can be translated as rustic understated elegance and aged beauty. Balance out bold colour. These bright flamingo pink kitchen cabinets make a wild wall of colour, and yet the overall scheme still comes across as well tamed. A marble backsplash and countertop add sophistication to the arrangement. A black dining table and plush grey fabric dining chairs take the colour scheme down a couple of notches. Use reflection to colour your cabinets. 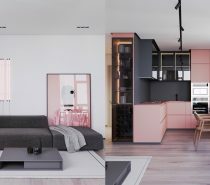 This inspirational kitchen design shows how you can introduce a subtle pink glow just by reflecting pink flooring or a pink kitchen rug off glossy white surfaced units. Wood tone and pink are a match made in heaven. The softest, subtlest pink units and kitchen island bring just a hint of warmth to this white decor, and work in perfect harmony with the warmth of the wood herringbone floor. One pink accent wall can add a quirky kick to a plain open plan. Dress the countertop with mini vases of floral blooms. A sweet pastel pink kitchen works well with nature’s greenery, and understated flora go well with the delicate look. Coordinate with colour. This pastel themed kitchen is coloured by a gorgeous tile backsplash in a herringbone design and matching pink kitchen stools. A pink tea set, pitcher and planter pepper the shelves with colour coordinated accessories. Go tropical. Push your pink feature wall into the bright coral end of the spectrum and team it with fresh green accents to create a totally tropical taste. Take your pink scheme to new heights with a pink painted ceiling. This effect works particularly well in rooms with a lofty ceiling height as adding colour up high can help the space appear warmer. Beware painting a low ceiling in strong colour as the effect can be overbearing and make your room feel smaller. Create a classic beauty. A pink kitchen doesn’t have to come across as ultra modern or quirky. This dusky pink kitchen has a beautiful classic vibe. Another coral and green example, but this time with strong black basenotes instead of a white background. Be original with your open kitchen shelving. This live edge wooden shelf looks the business against the warm tone of the kitchen feature wall. Choose a reflective copper or gold plinth to underline soft blush units with a flash of class. A collection of teapots decorate the open kitchen shelving in this one wall kitchen, set against a backsplash mottled with a pink and blue mix. Natural tones of wood, brown leather and woven baskets complement the pink spectrum. Create your own fabulous flooring design with flashes of pink. Check out this herringbone design floor that begins as solid natural wood tone before breaking away into planks of pink and white. The floor design ends in a solid white finish beneath a fresh pink and grey kitchen ensemble. Arrange a feast for the eyes. This sugary marshmallow pink kitchen island looks good enough to eat. Dark grey units behind the accent island prevent the scheme from appearing saccharine. A diluted shade of pink decorates the neighbouring utility room. Strike a match. Clouds of coral pink colour this kitchen backsplash, matching perfectly with the colour block kitchen design. Mix it up. Just because you have a pink kitchen doesn’t mean you can’t enjoy every colour of the rainbow when it comes to your kitchen accessories. Whether they’re green, yellow, bright lime, red, turquoise, or all of those, you might be surprised at how versatile a pink backdrop can be. Place pink against a solid black background for a seductive look. A plush black and pink floral kitchen rug makes this space look positively sumptuous too. Add weight to a light pink kitchen with a concrete countertop. Surprise! This sombre slate grey kitchen design has a hidden secret. Push back the dark bifold doors to reveal an uplifting pop of flamingo pink units, countertop and backsplash. Alternate the colour of wall units to make a pattern or a free-flowing design. Highlight the effect with under-cabinet strip lights. Blue tiles against a pastel pink kitchen makes an electric combo. Pick out a pattern in pink. The coral pink tiles of this kitchen backsplash, with intricate white pattern, introduce just the right amount of interest. A black kitchen faucet and concrete decor balance out the sweetness. Pink can work equally well as an accent in an industrial style kitchen. 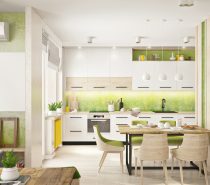 Continue coloured accents into a connected dining spot or open plan lounge. This kitchen diner displays a couple of pink scatter cushions over a dining banquette to neatly pull the whole look together. Add softness and depth to a painted feature wall with a rag roll wash, like the effect behind these unique kitchen pendant lights. Drop coloured cabinets down from the ceiling at varying heights over a peninsula. Pepper a monochrome scheme with colourful pieces like fruit bowls or bar stools. Work with what you’ve got. You can lift an existing white kitchen scheme with a relatively inexpensive pink upstand, some bright artwork and a statement rug. For a little more outlay you could replace worktops with a brighter option, maybe match up the plinths and apply decals to plain cabinetry. This kitchen design even has a pink sink to boot. This solid wood kitchen island gets the pink treatment via a shiny new countertop, like icing on a cake. Isolate a single stripe of colour. A pink range cooker with matching backsplash creates a shocking stripe through this white country kitchen. A horizontal stripe cuts across this white kitchen as wall cupboards. A couple of media cabinets match the theme over in an open plan lounge area. Perfect a patchwork of pink. This kitchen has a mix and match tile backsplash design, like a patchwork quilt. The patchwork tile effect repeats on the central kitchen island worktop too. Pink edged wall shelves, kitchen island drawers and a single bright wall unit in a dark niche also colour the room. Use large appliance to make a large statement. A pink SMEG fridge colours this kitchen. Bring colour in through tinted glass kitchen pendant lights. Rose pink makes an ideal hue for a vintage kitchen. A little girl’s dream kitchen: This galley kitchen is pretty in pink and Hello Kitty themed accessories. Think big. Take a bright backsplash from the worktop all the way up to ceiling height. This design goes big on pink cabinets, colouring the room with tall larder units and an expanse of wall cupboards. Pink kitchen curtains add a touch of summer cheer to even the greyest day. A huge kitchen clock over the lintel draws even more attention to the window treatment. Light it up with a stripe of pink lighting. Break up pastel tones with areas of rich wood tone. Even a very small kitchen can hold colour and pattern. Keep the look fresh with subtle muted tones and monochrome. Paint an old wooden dresser in your favourite colour to bring new life to a tired scheme.